A foggy windshield isn’t just annoying — it’s dangerous, especially when it forms on the inside of your vehicle. You can’t just switch on the windshield wipers to take care of it, and you’re too busy driving to wipe down the interior glass. What should you do? Don’t panic! A foggy windshield isn’t impossible to fix fast, but first you need to know why it happens. When fog forms on the outside of the windshield, that’s because it’s more humid outside than inside the car’s cabin. Thankfully, wiper blades can easily clear the windshield. You can also raise the interior temperature by turning off your air conditioning, or at least raising the temperature. The real problem is when you have an interior foggy windshield. It’s hard to wipe down, plus it leaves streaks on the glass that further interfere with your view of the road. Fog forms inside when the air in the car is more humid than the air outside. What can you adjust to make it go away? First things first — turn off the interior recirculation option. Otherwise, the car will continue feeding the damp, moist air through the system and you will still have a foggy windshield. The recirculator button has an outline of a car with an arrow inside. Turn it off before you do anything else! Next, it’s time to de-humidify the car’s cabin. Turn on the A/C, which will remove moisture from the air and bring the cabin humidity down, matching the drier exterior air. This is a common problem that can happen regardless of any outdoor temperature changes. Your car’s cabin can get a foggy windshield because of extra passengers breathing or even from piping-hot takeout sitting on the front seat. But when you know how to fix it fast, you aren’t at risk anymore. The Good News? It Will Soon Be an Outdated Problem. New cars are coming out with automatic anti-fogging features. Models from Chrysler and Fiat have climate control systems that include windshield sensors that scan the glass to ensure visibility is good regardless of the weather. Soon, you won’t have to monitor windshield fog at all — your car will automatically adjust your recirculation and A/C settings for you. 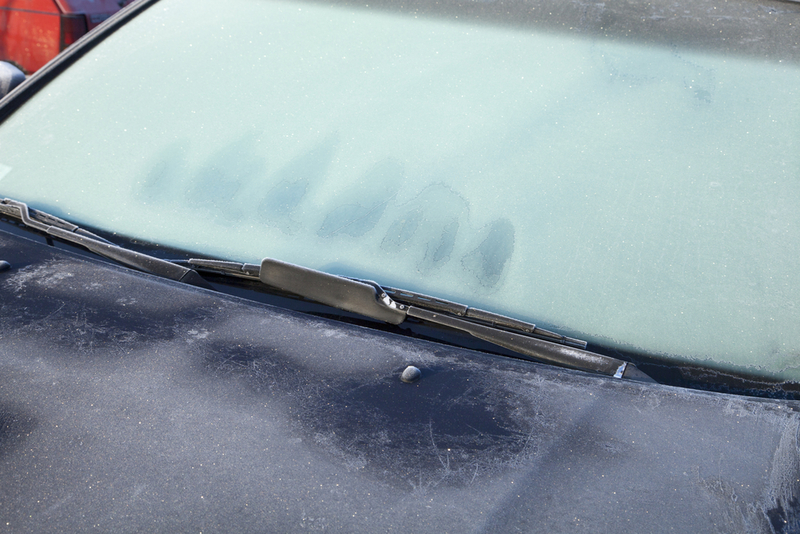 A foggy windshield isn’t the only problem you might experience when it comes to auto glass. Windshield chips or cracks also interfere with visibility and threaten your safety as well. Thankfully, you have Glasshopper Auto Glass on your side. We will come to you and quickly repair your windshield so you can drive confidently, knowing you can see and you’re safe. Call today to schedule your windshield repair appointment. This entry was posted in Our Blogs on August 15, 2017 by admin.